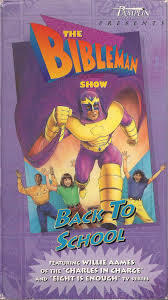 “Back to School” marks the second episode of the original Bibleman video series, “The Bibleman Show.” Willie Aames is once again the title role of Bibleman, and also shares directing and writing credit for the episode. 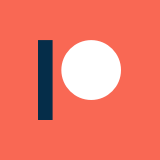 The rest of the team is pretty much the same from “Big Big Book”: C. Scott Votaw, Milt Schaffer, and creator Tony Salerno also have writing credits, with Votaw and and Chris Fann taking co-directing roles alongside Aames. In the first episode of “The Bibleman Show,” “Big Big Book,” I understood the amount of singing involved. I mean, it was centered around a church musical. However, this episode also starts off with singing, but without the inherent, semi-reasonable justification. It is eventually explained that the same group of kids is going to be performing a similar musical at a local school (thus “Back to School”), but that bit of exposition has to be awkwardly forced into a scene in the form of a fake telephone call. Could they not have come up with a song about a “Bible Bus?” That would at least be a closer comparison than a damn train. There is also alliteration to that phrase, which is perfect for this kind of lazy product. Why am I doing their job for them? The primary villain in “Back to School” is Madame Glitz: a vaguely sinister, vain, and fame-obsessed woman who inexplicably knows Bibleman’s secret identity. She operates with the help of a henchman named ‘Mr. Thug,’ which is pretty much all you need to know about him. Her primary motivation seems to be envy over Bibleman’s popularity, so she plans to kidnap him to turn his fans against him. If that doesn’t make a whole lot of sense to you, you aren’t alone on that. The story of “Back to School” once again focuses on a children’s musical performance, this time taking place at their local school (which I hope isn’t a public one, because that sounds like a separation of church and state violation to me). Bibleman is scheduled to appear alongside them, as he did in “Big Big Book,” but is kidnapped by Madame Glitz just before the show begins. Bibleman eventually prays his way out of his binds, terrifyingly imprisons Glitz in a television, and shows up in time for a grand finale with the kids. Kid 1: Wow! That was excellent! Kid 2: Yeah! Seriously, comic books are tame compared to this stuff. I think I’m going to go out and get me a bible! Kid 1: Cool idea! Me too! It is like the producers’ fantasy-land version of America’s youth. Shame it didn’t work out that way for them, isn’t it? I don’t recommend watching this episode, but it is available in its entirely on YouTube if you are just deathly curious. If you can’t resist, I implore you to at least skim through the songs, because you aren’t going to be missing anything with them. The only exception is, of course, “The Bible Train,” which managed to inexplicably fill me with hate and darkness.